A special day to shower your love with a special gift but – what to buy your girlfriend for Valentine’s Day? Chocolates and flowers seem so – classic and traditional. So what are the cool romantic Valentine gifts for her that will bring about a lovely cheerful surprise? 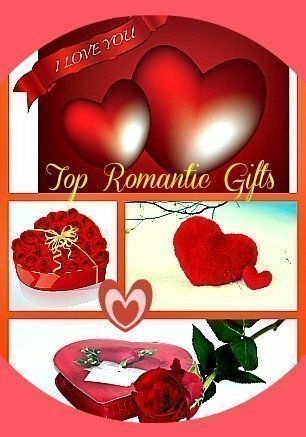 Should it be chic, stylish elegant Valentine gifts for that modern luxurious feel, retro nostalgic gifts that bring back sentimental memories shared together, therapeutic gifts wishing her a healthy life, romantic gifts hinting at sharing a dream together? Rosy cheeks and holding a bouquet of white roses, the traditional symbol for true love. 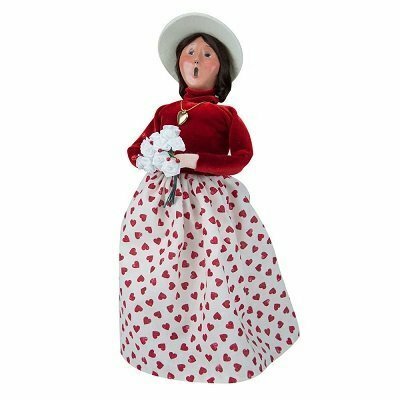 Dressed in a traditional red velvet blouse and skirt with heart details, this 13″ tall Valentine girl is all about love. Cute, fun and romantic, this is a great Valentine gift for conveying the message ” I Love You”. This Crystal 18kt Gold over Sterling Silver Slide Heart Pendant features rows of white crystals, studded between layers of warm, yellow gold. 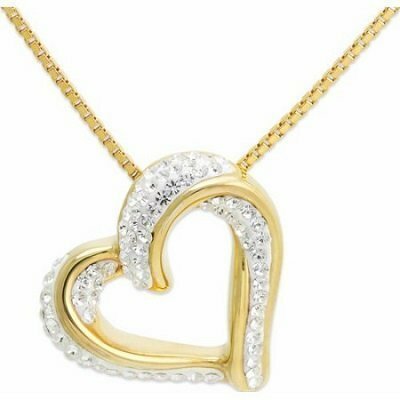 An 18″ gold over sterling box chain and 18″ open heart pendant complete the lovely jewelry. This lovely heart pendant and chain will arrived with gift-wrap. You can’t really go wrong with a piece of romantic jewelry Valentine gift for her. Luxurious Alpaca socks, artisan made Alpaca slippers, Alpaca scarves and sweaters make lovely gifts demonstrating the warmth in your heart. Alpaca socks keep her feet warm, cozy and toasty without being sweaty. The Alpaca slippers come with hand sewn leather soles, a warm Merino wool interior lining and a luxurious Baby Alpaca fur exterior. Alpaca sweaters are soft, warm and comfortable without being bulky. The Alpaca fiber is only half the width of a human hair and comes with a hollow core providing the ultimate insulation. 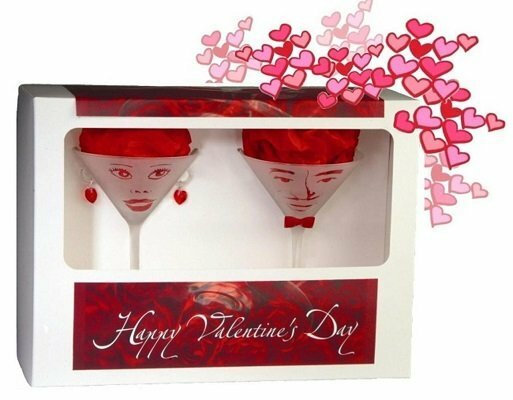 A pair of sandblasted glassware with a his and her face specially designed for Valentine’s day. Her sweet face comes with heart shaped eyeballs. She wears a pair of elegant red Swarovski crystal earrings dangling from the glass looped ears. He looks smart wearing a hand-made red glass bow tie. All the fine details are permanently etched into the glass. Made in USA, each glass has a capacity of 7.25oz. 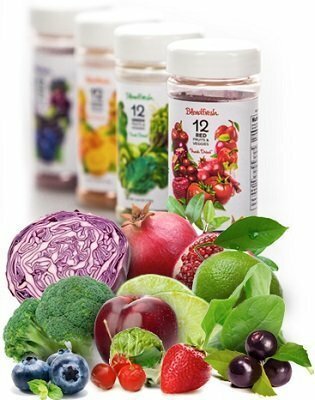 The gift of health – Blendfresh offers an easy way to take your fruits and vegetables that contain broad spectrum phytonutrients and enzymes. Blendfresh uses Fresh Dried technology that retains the antioxidant, vitamins or minerals of the original fruit and vegetable as well as the color and flavor. This patented technology retains 100% of the nutrients, vitamins, enzymes and minerals of the foods. The fresh dried food is also 100% natural and pesticide free. Paris is famous for its delectable pastries. 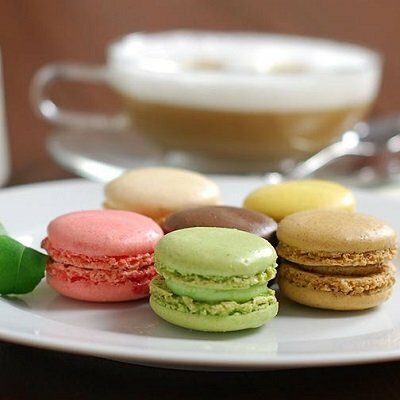 One of their most popular is the small round macaroons with their light, crispy and fluffy shell sandwiched together with a sweet or tart cream in between. Melt her heart with a box of these melt-in-your-mouth light and airy cloud-like French almond macaroons. Made with almond flour, sugar and white eggs, then filled with butter cream or jam, these mouth-watering cookies come in 6 different flavors – vanilla, coffee, chocolate, raspberry, Pistachio and lemon. You can get the 12 pc box or 72 pc box, prepacked with all 6 flavors included. Only the small box comes nicely packaged with a ribbon. This lovely necklace is hand made from hand patinaed bronze with cranberry freshwater pearl as the pendant. The necklace is made from a string of cranberry faceted agate beads. The necklace is made in USA. It has an adjustable length of between 16″ – 18″. You might want to pair it up with a pair of Cranberry freshwater pearl post earrings. 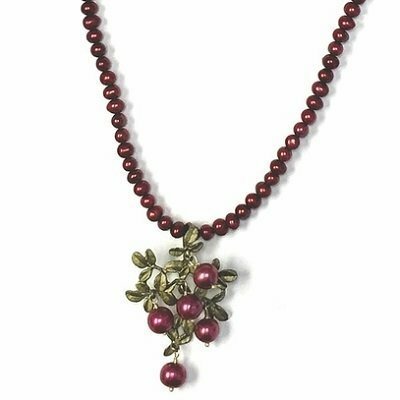 This lovely cranberry freshwater pearl necklace would surely bring out the glow in her face and the love in her eyes. An aromatherapy diffuser that sends out soothing aroma drifting slowly throughout your room. Put one in your bedroom to help you sleep better or put it in the office to relax and de-stress. Depending on the essential oil used, it can also help lift you up from a depressed mood or even set the romantic ambiance for a candlelight dinner for 2. 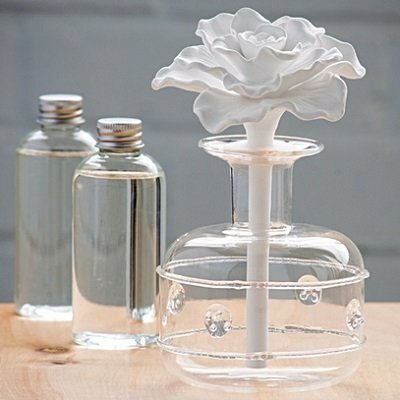 The porcelain flower diffuser includes an unglazed porcealin blossom sitting in the scented oil inside the glass jar. It diffuses a subtle scent into the air. The light, lovely aroma of tuberose is not overpowering. Two 6.8 oz. bottles of scent are also included in the package. It is packed in a beautiful box and measures 7 1/2″height x 3 3/4″ diameter. 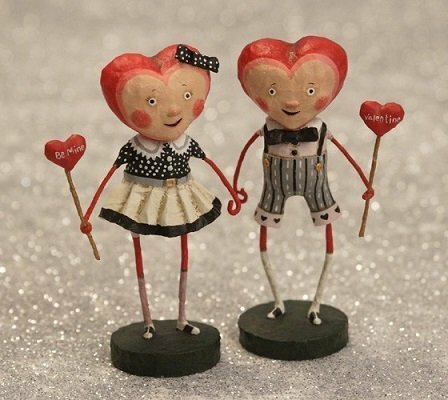 A cute and adorable Valentine couple figurine that oozes with true love would make a terrific romantic gift for Valentine. The lovely couple come with red heart shaped heads and rosy cheeks. Standing at 5.5“ in height, they are made of resin. This Sweetheart couple would make a really lovely decorating item too. Your names carved onto wood and displayed on your bedroom wall as a reminder of your everlasting love – now, that’s so sweet and so full of love. Carving names onto a tree trunk has always been associated with love and romance. Capture your love together forever with this meaningful rustic wood carved heart canvas print. It comes with a rustic faux wood fence background with your 2 names engraved in a faux stone heart. A simple white 100% cotton tee shirt with the meaningful words “His better half “. A gift to let your girlfriend knows that you considered her your better half. This woman’s basic t-shirt is available from size s to 3x. 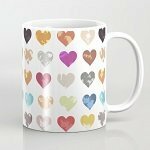 What a lovely way to show your love and give a hint of a future together – a Future Mrs coffee mug. This is a custom designed mug. You can change the last name to yours. You can also change the words “Future Mrs” to an image of your choice. 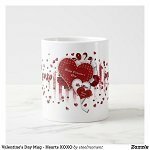 A coffee mug that she would most probably use every day, always reminding her of your love. 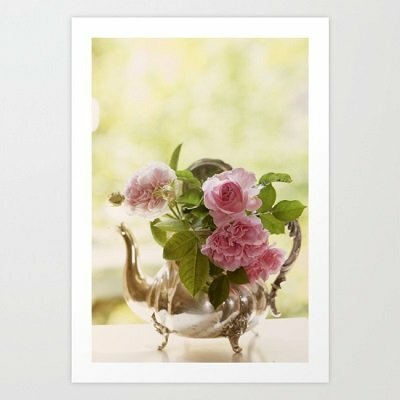 An art print featuring pink roses in a vintage silver teapot with a wonderful green and tender bokeh background. The photograph of the lovely image is digitally printed (Giclee printing) onto acid and lignin free archival paper using Epson K3 archival inks. This is such a pretty piece of romantic art print gift giving the feeling of a gentle and beautiful love shared together. 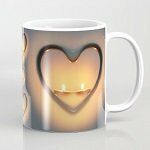 This romantic coffee mug would be much loved. I would love to drink from a mug with the most beautiful watercolor roses in a blue background with white dots. Add in the words “You are my Happy” and this would make a superb romantic gift on Valentine’s day. This ceramic coffee mug is available in 11 and 15 ounces sizes. It comes with a wrap-around image and a nice-to-hold large handle. 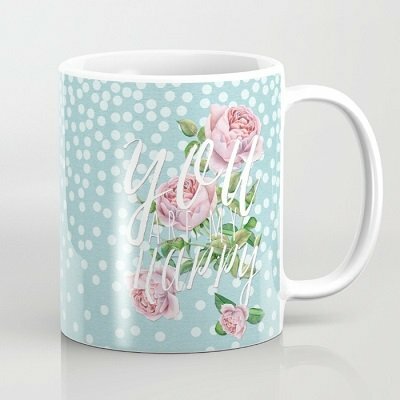 You can’t go wrong with this You Are My Happy watercolor roses coffee mug. An adorable young couple sharing a tender moment is such a sweet sentimental sight. The lovely girl is holding a bouquet of delicate porcelain white pitimini roses wrapped in green leaves and wearing a flowing gown complemented with subtle flowers. 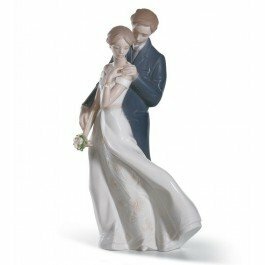 Gifting her this Lladro everlasting love sweet couple figurine is a most romantic way to tell her you’ll love her forever. Giving chocolates is very traditional. Make it a very unique traditional Valentine gift with the high heel shoe dark chocolate. These shoe chocolates pump heel with Fuschia lace print. The stiletto shoe is made of premium chocolate. Now, that’s a really unique special romantic gift for that special someone in your life this Valentine. 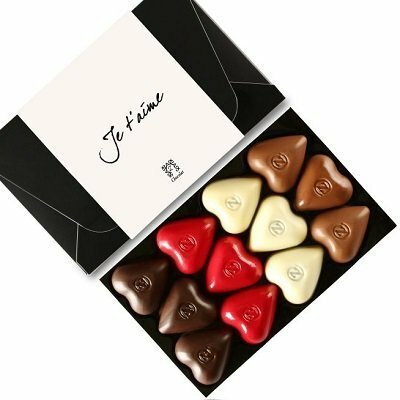 12 pc heart shaped chocolates that melt in your mouth will surely melt her heart too. Amore: a divine bergamote-infused ganache hidden under a daring red robe. If you would prefer a bouquet of flowers to show your love, then check out this The In Love with Red Roses Bouquet signifying love and romance. Create the perfect moment with the right ambiance for love with this bouquet of red roses. 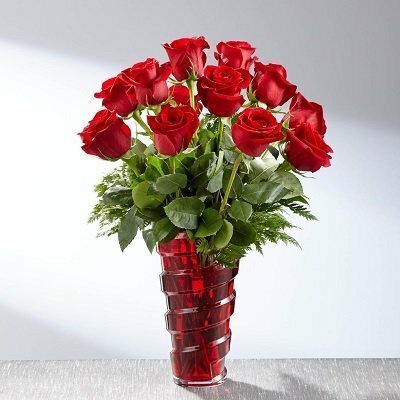 Make your lover smile with this lovely rose bouquet presented in a beautiful red glass vase.